Last week visitors of the Amazon website were looking at a complete new line up from Samsung cameras. 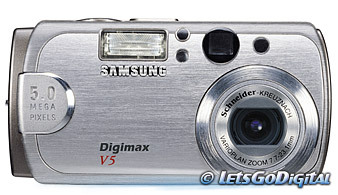 During the day before the PMA in Las Vegas kicks off Samsung showed their new series of Digimax digital cameras. We now introduce to you the new 5 Megapixel camera; Digimax V5. This model is one of the three models added to the Digimax V series. The others one V models are introduced in the next article. The Digimax V5 offers Schneider optics, support for nine different power sources, three customizable user profile settings and a super macro feature that gives the user the opportunity to get as close as 6cm away from the subject. Beside having a resolution of 5 Megapixels the V50 features 3x optical zoom and a 4x digital zoom resulting in a total zoom of 12x. One of the many features that sets the Samsung Digimax V Series cameras apart from others digital cameras is the ability to support nine different power sources including CR-V3 Lithium, AA alkaline, NiMn, Ni-Zn, NiMH, NiCd, SRB-1437 or SBP-1103 rechargeable Li-Ion batteries, and an AC adapter. The V-series of Samsung cameras also combines the famous Schneider optics with advanced manual shooting capabilities like creating a Super Macro shot resulting in a perfect image. Once you've captured the image you want, Samsung's trimming and resizing functions allow you to edit the image right on the LCD, without even connecting to a PC. Beside still images the V series also allow users to add 10-second audio captions to still images, record audio to accompany their movie clips and record up to 2 hours of audio alone, depending on the storage capacity of the memory card that is used. The Digimax V Series cameras come bundled with a 32 MB SD memory card. The convenient shooting mode dial allows users to easily choose from multiple shooting modes including easy, program, portrait, night scene, movie clip, voice recording and A/S/M (aperture, shutter, and manual). An easy to use 4-way key and OK button allows users to navigate the options menu and provides quick and easy access to a variety of features including flash, self-timer, MIC and metering. The brightness level of the 1.5-inch color TFT LCD monitor on the V5 is adjustable to ensure easy viewing and reviewing of images in any lighting conditions. The "My Set" function allows users to personalize their cameras like never before by choosing up to 9 different camera settings such as image size, quality and ISO and saving them in a customized profile. By allowing users to create up to three different "My Set" profiles, only the Samsung Digimax V Series cameras provide the ability to be ready to shoot superior quality images in any conditions at the touch of a button. The Digimax V5 combines style with substance, and is designed for speed. It powers up in less than 3 seconds, announcing its readiness with a sound effect and graphics on the LCD display. The start up image on the LCD can even be customized on the V Series cameras, allowing the user to choose their favourite photo as a personal start page. The cameras' "Quick Play" feature allows users to immediately review single images, thumbnails, slide shows and movie clips at the touch of a button, even when the power is off. The Digimax V5 features single, continuous and auto bracketing shooting modes. With the high-speed auto bracketing feature, 4 to 1/2,000 frames per second can be captured with different exposures. The new V5 supports multiple file formats, including TIFF, JPEG and DPOF for still images, as well as AVI (MJPEG) for movie clips and WAV for audio files. The menu offers multiple language support including English, French, Italian, German, Spanish, Korean, Russian, Portuguese, Swedish, Danish, Dutch and more. All V Series cameras come equipped with a full compliment of accessories, including a stylish carrying case, USB cable, user selectable NTSC/PAL video cable, and applications and software driver CD-ROM and a wrist strap.